« Independent Contractors or Employees: What’s In A Name? The Festtage of the Staatsoper Berlin, founded by Daniel Barenboim in 1996, is not officially an Easter Festival. But while the Berlin Philharmonic left the Philharmonie for some mountain air (taking up residence for the first time this year in Baden-Baden), the maestro— between conducting the first full cycle of the Cassiers/Bagnoli Ring production, which has unfolded between the German capital and Milan since 2010—presided over ensembles of both the Staatsoper and La Scala in two different Requiem masses. The pianist and conductor, currently music director of both opera houses, opened Mozart’s Requiem on April 1 with W.A.’s last piano concerto, KV 595. The Staatskapelle’s rich warm, strings lent the music great strength—particularly in forte passages—while gentler nuances could have been more florid and secretive. Still, the balance with the piano was ideal in the opening Allegro. Barenboim brings a wonderful spontaneity to his performances—even if there were a couple of smudges on the keyboard—and he masters the Staatskapelle’s full-bodied sound with a firm but giving hand. The final Allegro movement, which opens deceptively with a variation of the chirping song Komm, lieber Mai, attained a mysterious quality that provided a captivating bridge to the Requiem, where Mozart could no longer take refuge in the childlike playfulness that masks a complex spectrum of emotions in other late works. The mass, which lay unfinished on the composer’s deathbed, conveys a God-fearing sense of his own mortality. It is not until the bright E-flat major triad of the Sanctus movement, completed largely by Mozart’s contemporary Frank Xaver Süßmayer, that the light of day shines. There is nothing operatic about the work—one of several masses Mozart wrote between 1768 and 1791. As penetrating as the voices of the Staatsoper chorus were, one almost wished for a more penitent approach. Of the soloists, it was René Pape and Bernarda Fink—respectively the lower male and female voices—who captured the music’s demands for internal spirituality. Rollando Villazòn seemed to vie for attention with his hystrionic facial expressions, so it was all the more excruciating when he switched suddenly from head to chest voice mid-entrance in Tuba Mirum. He managed to push above the ensemble later but it seems unlikely his timbre will ever recover the luster it bore pre-vocal crisis. Soprano Maria Bengtsson lent every line a pretty, creamy sound, but her inflections were often mannered. The Staatskapelle performed with increasing intensity, investing Domine Jesu Christe with an incision that drove to the heart of the music. Barenboim brought the final Lux Aeterna to a spaciously paced close. Verdi’s Requiem, performed March 30 with the orchestra and chorus of La Scala, is unarguably the more theatrical of the two masses, emerging in the 1870s when the composer wrote no new operas. Verdi, moved to complete the work upon the death of his literary hero Alessandro Manzoni in 1873, nevertheless commented modestly that with so many Requiem Masses “there’s no point to writing one more.” He was wrong. His Dies Irae is one of the most petrifying moments in musical history, the chorus descending into a fiery pit of swirling strings and brass so demonic that even Wagner looks tame. The effect was nearly ear-numbing from my seat on the balcony above the stage, but I couldn’t miss the chorus’ homogeneity of tone and commitment to every syllable. Daniela Barcellona gave a lesson in rich shading, carrying effortlessly across the hall in her solo of the second Dies movement. Soprano Maria Segreta, stepping in last minute for Anja Harteros, has a sweet timbre that sometimes struggled to hold its own alongside the voluminous mezzo, although it’s impossible for me to judge properly given the acoustics from my seat. They struck a placid balance in Agnus Dei. 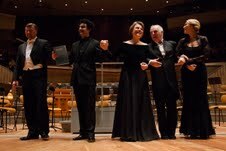 Pape was his usual serene self, and tenorissimo Fabio Sartori rounded out the ensemble with a penetrating but unpretentious tone. The musicians of La Scala made clear how deeply this music flows in their veins, phrasing with an unforced fluidity worthy of the highest Kunstreligion. This entry was posted on Thursday, April 4th, 2013 at 8:02 am	and is filed under Berlin Times. You can follow any responses to this entry through the RSS 2.0 feed. Both comments and pings are currently closed.